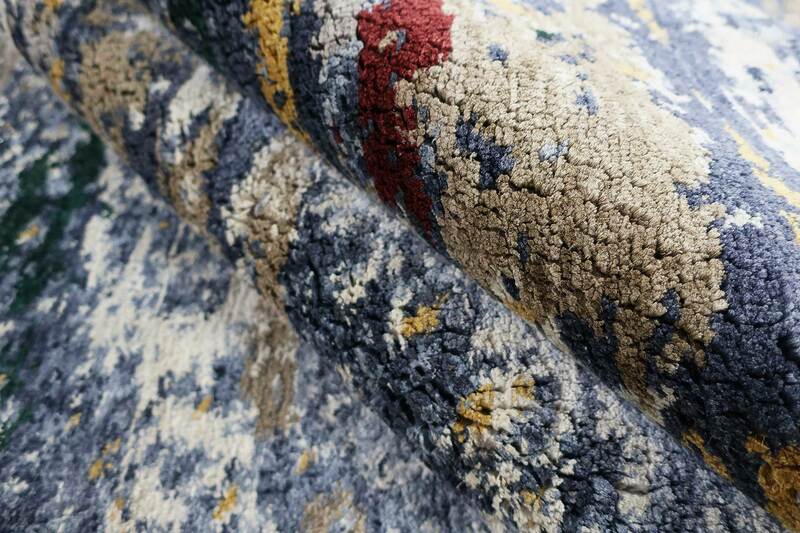 With the new Svarga Collection, the carpet manufacturer Mischioff adds luxurious silk rugs to its range. While the pile height of up to 22 millimeters guarantees an incomparable haptic experience, the sheen of real silk conveys pure elegance. The high-quality natural material skillfully emphasizes the artful designs and is processed into long-lasting accessories with the help of traditional craftsmanship. After Mischioff presented selected Svarga high-pile rugs at the international furniture and furnishing fair imm cologne for the first time and the feedback was overwhelmingly positive, the collection is now being expanded by further models. Discover the impressive designs and benefit from outstanding product features! The Svarga Collection is characterized by complex colour gradients in different variants. Including modern-abstract structures that invite the viewer with harmonious nuances and exciting transitions to explore the textile works of art. 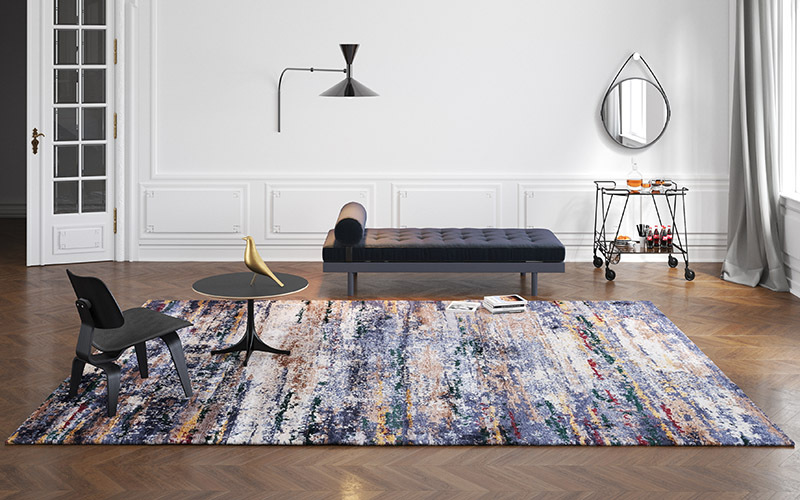 Designed by the successful designers Dani and Sascha Misio, the rugs reflect their artistic creativity. Whether staged as a central style element or arranged with designer furniture to a sophisticated ensemble: With a rug of the Svarga Collection you take advantage of a fabulous eye-catcher. Simple patterns and monochrome structures are common in high-pile carpets. With the Svarga Collection, Mischioff proves that things can be done differently and combines sophisticated designs with the advantages of high-pile home accessories. Shaggy furnishes rooms with maximum comfort and transforms them into inviting zones. In addition, high-pile carpets optimize the acoustics through sound-absorbing functions. They provide warmth and enrich any interior with a cozy charm. Compared to silk carpets of other Mischioff collections, including our Sichouk Collection, the Svarga models have more than twice the pile height. If you like the design of the Sichouk rugs, you can order it as a Svarga high-pile version. The same applies to the Nilanda Collection. The Svarga Collection uses the finest silk, a natural fiber with outstanding properties. Its supple surface structure promotes the special feel of the high pile rugs and contributes significantly to the positive running feeling. For visual stimuli, the silk gloss and the brilliant colour reproduction are responsible. Silk absorbs pigments well and leaves every nuance shine. Depending on the perspective of the viewer, the designs shimmer individually. In addition to haptic and optical advantages, the natural fiber excels with its extremely high strength. Silk is extremely tear-resistant and ensures dimensional stability. Not to mention the high knotting density, which can be realized due to the fineness of silk fibers. The density is in turn associated with a high net weight of the carpets, which makes them sure-footed and provide reliable hold. Like all products from the Mischioff range, the rugs of the Svarga Collection are also manufactured in our manufactory in Nepal. From spinning the fibers to knotting to the time-consuming finishing, all production steps are made by hand. Experienced weavers implement the designs precisely according to the original and achieve around 160,000 knots per square meter using the Tibetan knotting technique. The result are perfectly finished structures for the highest demands. In Mischioff's carpet manufactory in Nepal fair working conditions and sustainable processes are a matter of course. As a manufacturer, we are certified by the Fair Trade Label STEP and our manufactories are regularly visited by independent inspectors. By buying our fair trade products, you are helping to promote fair trade. All details on fair trade and its basic principles can be found under Production & Fair Trade. Since standards are not always the best choice, we also make the Svarga Collection according to customer demands. Tell us your ideas and look forward to extraordinary unique items! In the projects and references area you will find many inspirations. Would you like to see first the colours, material and feel of our carpets? Send us your inquiry today and receive free samples! For the search for textile accessories that complement your projects in the best possible way, our virtual sampling service is an effective aid. We visualize a selection of rugs inside the existing interior. Then you can get a realistic impression. Find out now about our service or send us a no-obligation inquiry! In addition to the Svarga Collection, you should not miss product lines like Tibey, Mamlin or Nilanda. Mysterious medallions, artistically staged linear structures and geometric patterns are waiting to be discovered. Equally interesting are Classics & Antiques, antique collectibles and perfect reproductions of elaborate oriental rugs. Uni rugs can be found in the Plain Collection. Since we only supply the specialized trade, you can use the retailer search function to find regional sales partners. There you can buy Mischioff rugs directly or get comprehensive advice. We are also happy to send you free samples to help you make a purchase decision. Simply request via our contact form! Creative interior design ideas have been compiled in the current catalog. In addition, exciting information on the production site in Nepal is included. The catalog will be sent to your desired address free of charge. We also recommend a look at the Mischioff online catalog. After creating your personal account you will enjoy virtual access to all designs of our range.